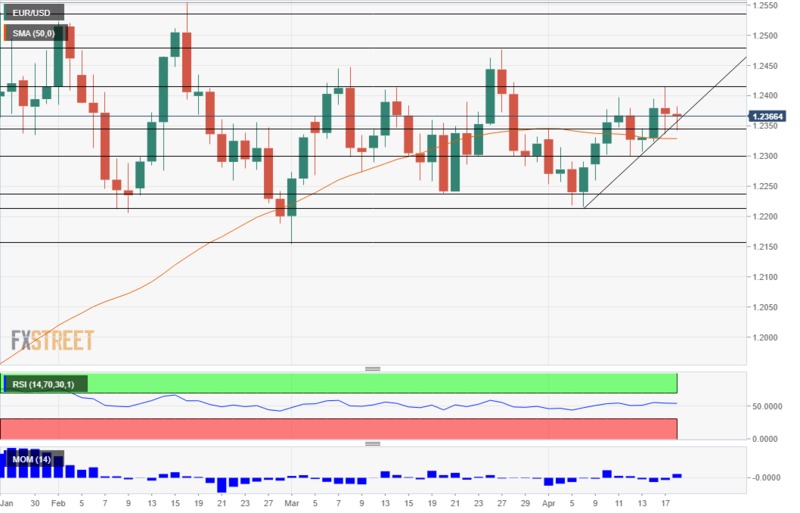 The EUR/USD is on the back foot once again, but ranges are limited. Disappointing euro-zone data continues piling on while US data is mostly positive. The technical picture continues having mixed signs for the pair. The EUR/USD is trading around $1.2365, balanced on the day. The latest blow for the pair came from the downgrade of euro-zone inflation data for March from 1.4% YoY to 1.3%. Core inflation was left unchanged at 1.0%. The final inflation reads usually confirm the data and this downwards revision was a disappointment. The pair dropped before stabilizing. The weak data continue accumulating. On Tuesday, the German ZEW Economic Sentiment plunged to negative territory at -8.2 points, indicating a downturn based on trade fears. Hard data has also fallen short of expectations in the past few weeks. Trade is also a topic that markets are busy with once again. After a week which saw China and the US exchange pleasantries and the TPP back on the table for the US, things look a bit more complicated now. Trump’s Top Economic Adviser Larry Kudlow has cooled expectations about the trade agreement at a time that a big proponent of the deal, Japanese PM Shinzo Abe, is meeting with Trump. Elsewhere in the US, recent economic releases have been upbeat: both Building Permits and Housing Starts came out above expectations, showing growth in the construction sector. Industrial output also continues rising. John Williams, the incoming President of the New York Fed, seemed optimistic about the economy while shrugging off a potential inversion of the yield curve. There are no US economic gauges scheduled for later today, leaving the focus on sentiment, which has been slightly optimistic. The reported meeting between CIA Director Mike Pompeo and North Korean Leader Kim Jong-un has helped hopes for a road to peace in the Korean peninsula. Pompeo, which has been nominated as Secretary of State, has been preparing the Kim-Trump Summit which is now due in June. All in all, there are more and more worrying signs about the euro-zone while the US economy looks steady. The EUR/USD is flirting with the uptrend support line that accompanies the pair since early April. A drop below it may be a bearish sign. However, it continues trading above the 50-day Simple Moving Average, the RSI is slightly positive and so is Momentum. None of these gauges is decisive, and the pair is generally range-bound. Looking down, the pair has some support at $1.2345, a high in early-April. The round number of $1.2300 follows after holding the pair back on April 12th. The April low of $1.2210 is waiting below. On the topside, the peak of April 17th and March 14th of $1.2413 is immediate resistance. The March 8th high of $1.2447 and the March 27th high of $1.2480 are next.